While the movement of octopuses could be described as a simple elegance, it may shock you to learn that in fact, they really have no underlying rhythm, according to the latest research. 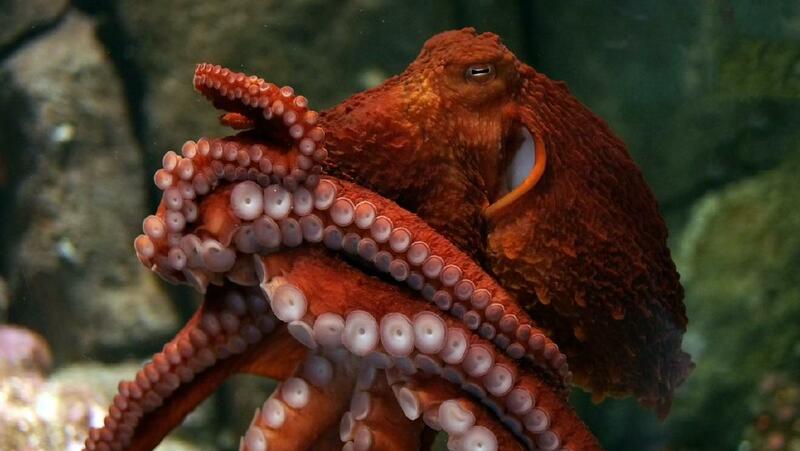 Each of the octopus’s eight arms is soft, flexible and muscular, almost pure muscle but capable of acting like it contains an infinite number of joints, according to the study’s lead author, Guy Levy, who is a postdoctoral researcher of neurobiology at the Hebrew University in Jerusalem. Until now, however, scientists have long sought to understand exactly how these marine animals are able to flawlessly coordinate their movement with a total of eight long and complex tentacles. What also makes these animals so endearing for study is their incredible brain power – as they have long been reputed to have the ability to remember. Their brains contain half a billion neurons, compared to most mollusks who have only 20,000, giving them the biggest brains of all invertebrates. Equally, if not more astounding, is their incredible talent for mimicry – imitating the shape and color of a number of marine creatures. In order to further understand more about how these brainy creatures move so gracefully, either swimming, crawling the sea floor, or even creeping stealthily on land, the researchers watched a number of high definition videos, frame by frame, which showed octopuses crawling around in large water-filled tanks. Octopuses possess a rather unique strategy in order to coordinate their arms when they crawl, the researchers discovered. The cephalopods are in fact, bilateral symmetric, which seems like a mouthful, but simply means that both their left and right sides are perfect mirror images of each other. The majority of bilateral-symmetric animals are facing forward as they move, with one of the few exceptions being the blue crab, which typically moves sideways. They may even possess the ability to play, puffing around the toy placed in their tanks with jets of water – something that not many other invertebrates do. But octopuses have an advantage: They are able to crawl in any direction that is relative to the orientation of their body, according to the researchers. In other words, unlike you or me, octopuses do not have to maneuver their entire bodies in order to change direction. All it takes is one of the octopus’s arms to push the entire animal from ofs a surface and then propel it any which way, Levy said. “It simply chooses other arms to push the body, and the direction is changed automatically,” he added. The scientists also learned that the octopus moves by way of shortening and elongating its arms, an action that results in a pushing thrust in the water. The animal does not have to actually bend or pull on any of its arms, something that makes matters a bit simpler for the giant mollusk, according to Levy. However, after they had witnessed hours of octopuses moving on video, the researchers concluded that the octopus has no discernible rhythm. While most animals maintain a type of rhythm as they move, for example, people that move their legs in a left-right-left pattern, so far the octopus has no predictable rhythm in the coordination of its limbs, the researchers said. “So, either there is no pattern, or it’s too complicated to identify with the techniques that we used,” Levy said. The researchers did observe patterns of movement in their individual arms, which would conversely shorten and elongate, but there was no pattern apparent whenever the scientists observed all eight arms at once, Levy added. It is likely that the octopuses acquired their unusual form of movement because, unlike their clam cousins, they do not contain protective outer shells to guard against predators, the researchers said. Unsurprisingly, the octopus is suspected to have an ancestor somewhat reminiscent of a snail, with one muscular foot that in time evolved into eight long and slender arms, which gave its descendants a great deal of flexibility. Octopuses gradually developed excellent vision, along with a large brain and also camouflage capabilities, traits that made them into adept hunters. This means that octopuses would also require an effective way to travel. According to the latest research, “The [octopus’s] strategy is simple enough, and it has a small number of parameters, and this is how it succeeds,” Levy said. The results are a prime example of a concept known as “embodied organization.” For many years, researchers believed that these motor-controlled strategies were designed in order to suit the body. This concept of embodied organization, however, implicates that both motor control and the anatomy both evolve together, and they occur out of a response to the environmental pressures which are capable of influencing both, said the researchers in their paper. The scientists are planning to use their findings in order to help engineers develop soft, easily manipulated robotic arms, Levy said. Along with the study’s senior author, Binyamin Hochner, a professor at the Hebrew University of Jerusalem, Levy hopes to further continue study on the octopus. The team has already discovered the reason why these creatures don’t inadvertently tie themselves up in knots, or tie up each other, which seems like a likely hazard due to the number of their limbs. The next phase of their plan is to uncover those neural circuits that are responsible for the octopus’ ability in coordinated crawling, Levy said, how they use their muscular tentacles for agile movement along the ocean floor. These findings have been published online today (April 16) in the Cell Press journal Current Biology.